Get away from the phones, house cleaning and any other distractions while you spend the weekend learning something new and/or getting other projects finished. Get away from the phones, house cleaning, and any other distractions while you spend the weekend learning something new and/or getting other projects finished. Join Quintessential Quilts for our Retreat/Seminar at Ho Chunk Convention Center. 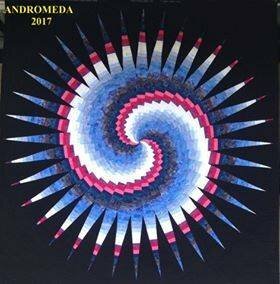 Disappearing Spiral Bargello ...You are not required to do the project and can bring any other projects you would like to work on throughout the weekend. The sewing room will be open every morning at 7:00 AM and we sew until 2am Friday & Saturday- we end at 4pm on Sunday. Fee is $175.00. With registration you will receive a special 20% discount on your retreat supplies and during the retreat weekend. Kits will be available or come in and select your own colors. Space is limited “sew” don’t delay. If you choose to stay at the hotel a block of sleeping rooms has been reserved at a special rate, you will need a code to reserve your room.